Those of us that ride a motorcycle do so for the way they make us feel. The latest generation of sporting hardware has far more performance potential than most of us could ever use on the street! We ride them because we love to ride them and a huge part of that attraction is how they look. Your bike is sleek, beautiful, proficient and you love it! None of us ever wonder why they are often removed during photo shoots. It's because they are "less than attractive". 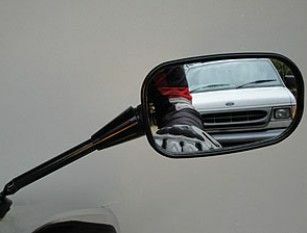 Many companies sell mirrors that are tucked in nice and tight for a better look but they are useless for rearward vision. The extendable mirrors I provide are also tucked in tight. They are lower and tighter to the bike than stock. Much better looking! The difference is that my mirrors can extend when necessary so they can actually be used! Turning your head to look beside or behind you is fine sometimes but things can sure happen fast on the road and I prefer to keep looking forward. 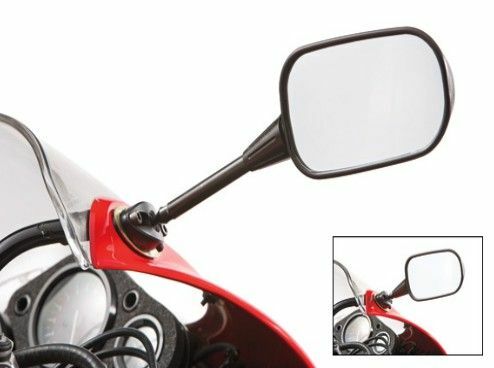 The Extendze Mirrors system will also allow you to retract the mirrors when parked in the garage which lets you park closer to the wall and will also let you walk by the bike without needing to dodge the protruding mirror. At full retraction the mirror head is just 2.75 inches from the mount base. At full extension the mirror is 6 inches from the base! A range of 3.25 inches! Our mount has been redesigned to allow more adjustment and fitment to an even larger number of models. These are a 'MUST HAVE' for any experienced rider who values safety and style. This is the only system that extends and compacts to suit your requirements. No tools are needed; just a twist of the wrist! 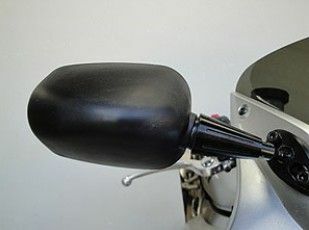 A quarter turn of the flare at the base of the mirror head is all it takes to allow the mirror to be moved on the shaft. A turn the other direction locks the head on the shaft in any position the rider wants. There is no limit to the number of adjustments that can be made; the system will NOT wear out. At full retraction the mirror head is just 2.75 inches from the mount base, at full extension the mirror is 6 inches from the base! A range of 3.25 inches! Our mount has been redesigned to allow more adjustment and fitment to a much larger number of models. Chances are good that you will be able to use your stock mounting!